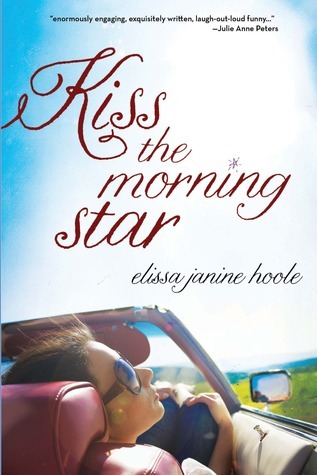 Today I’m thrilled to have Elissa Janine Hoole on my blog! Her upcoming YA, KISS THE MORNING STAR, is to be released this May by Marshall Cavendish. When Anna sets out on a post high school road trip toward an unknown destination with best friend Kat, she thinks she’s prepared for everything. Clipboard in hand, she checks off her lists: Set up tent. Study maps. Avoid bears. Feelings are not on any list. For the past year – ever since her mother’s sudden death – Anna has shut down her emotions and shut out the people who love her most. 1. Tell us a little about the process of starting the idea for KISS THE MORNING STAR to publication. I started the story in September of 2008, and I took about a year to write and revise and get what I thought was a polished, query-ready draft of my book, which was then called The Dharma Bum Business. I queried it during the summer of 2009 and had a few agent requests including a few very kind agents who gave me a lot of feedback, and two who told me that the voice might benefit if I tried changing the point of view of the story from third to first. I admit, I thought it wouldn’t work—it would be little more than an exasperating exercise in pronoun replacement. Instead, I found Anna’s voice emerging, the story becoming more immediate. I sent it out again that fall, and this time I had multiple requests for the full manuscript, and eventually, some offers. The greatest moment was when my awesome agent, Sarah Davies of Greenhouse Literary Agency, called me from London right before Christmas. I had no idea she was going to call, and the shock of it, the excitement of her telling me that she had read my book and was really intrigued by it, was the best thing that had happened in all my years writing and trying to get published. Her immediate enthusiasm was impressive, and that phone call remains one of the most exciting moments of my writing career. I revised again for Sarah, and we sold to my editor, Melanie Kroupa, at Marshall Cavendish books, in June of 2010. I’ve enjoyed working with Melanie tremendously; she has a brilliant knack for drawing out the story I have in my mind and helping me to translate that story onto the page. 2. I think it’s so neat how your traveling adventures inspired KISS THE MORNING STAR. Was there are particular event that had a big impact on the story? I think, rather than a particular event, the biggest impact on the story was more the spirit of the travel—the idea of road-tripping without an itinerary, without even a destination. I learned so much about myself and about my love, and about what I wanted out of life. 3. What is the most rewarding part of writing for you? Sometimes I say that the most rewarding part is being finished—having a scene or a sentence or even an entire massive revision turn out just the right way, a way that makes me proud. And that’s true, it’s probably the most rewarding part, but along the path to being finished, the parts that I love best are when something slides into place so that writing, for even the briefest of times, comes easy. The flow, the surprises, the images that rise up to the surface without digging for them—these moments are the highs of the writing experience for me, the parts that get me through all the slogging parts or the parts where I have to keep slapping words one in front of the other just hoping for them to make something worth revising later. 4. Share with us the one piece of writing advice you wished you had when you first started writing. I’m never good at following advice. In fact, something about advice, no matter how sound, makes me sort of bristle and want to do the opposite. But I think the best advice I can hope to try to follow is the advice to get out into the world and live life if you want to write about it. 1. Favorite type of chocolate: The darker the better, but chocolate is not my weakness when it comes to candy. 2. #1 country you’d like to visit: I want to visit most of the Scandinavian countries, so I’ll start with Norway. 3. Favorite mode of transportation: The passenger seat of a car with my feet on the dash and a book in my lap, with my husband driving all the back roads to anywhere. I know you want to read this book! Fill in the Rafflecopter to win a copy when it’s released! This sounds like great book! I’ll be watching for it. A wonderful story of the journey it took to write the story of a journey! First, I’ll go to Japan and stay there for 4 months, so that I could absorb every wonderful thing about the country. Third, maybe I’ll go to the moon or Saturn. I’ve really like them… That’d be great if I could really go there! I love the concept of running away on a road trip, trying to escape the things you eventually find. Central and South America. I need to see the Mayan Temples. Also, Venice before it sinks!!! If I could travel anywhere, I’d go everywhere. These are great places to go! And yes, Carl, everywhere, well almost everywhere would be fantastic. And I too, want to go to Bora Bora! Japan or Australia/New Zealand or England! I’m reading this book right now and it is completely flipping amazing!!! I want a copy of my own! If I could travel anywhere, I’d go to Fiji! sounds like a great story! thanks for the interview and giveaway! Love hearing about the writing process and success. This is a fun intereview. Yes! Road trips are so much fun. Full of possibilities. I love hearing how authors found their agents and the process they went through to write the book. Love the premise. Is the giveaway international? I would travel to England as I’d love to meet my relatives!